Graystone Industries is proud to help support the Hire Heroes organization. This charity helps find employment for our nations veterans as well as providing job skills training when needed to ensure a lifetime of opportunity. Last week I was on a business trip through Florida when I exited the turnpike with the gas gauge sitting well below empty. Approaching the exit light I quickly shot into the right hand turn lane having seen the gas station just up the road. While waiting at the light, I looked over to the left hand lane and saw a man standing there. He was an older gentleman, clean cut and wearing a very worn but spotless military shirt. This man also had a metal leg. Perhaps what stood out most was this man's poise. He did not walk from car to car asking for money. Instead he stood stiff in a parade rest type stance while with one hand he held a small sign that simply said he was a veteran and "my family could use a little help". Standing rigid he only moved when someone motioned him over where he limped up, and accepted their contribution with heartfelt thanks before resuming his previous stance. Everyone loves a great deal and everyone loves finding a super low price online. However, the "best price online" is often times not the BEST deal. If a customer is looking for a book, the lowest price is a no brainer. Need a certain pair of shoes? Well then they either fit and are comfortable or they don't and you send them back. After a long hard winter, most of the US is thankful to be finally heading into Spring. 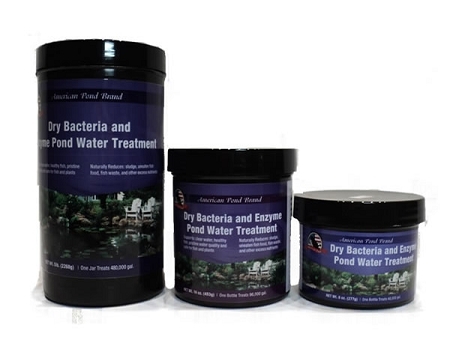 With the warmer weather upon us, pond owners should now be thinking about their annual spring startup. Many will completely drain their ponds, scrub out the muck and refill. This will be the time to start a maintenance program of beneficial bacteria treatments.